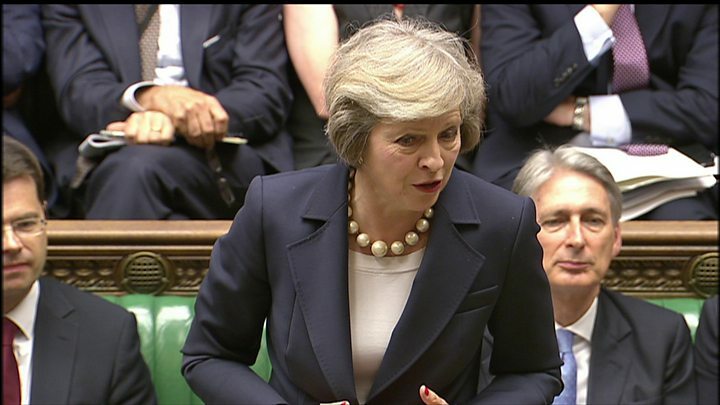 Theresa May likened Jeremy Corbyn to an "unscrupulous boss" as she made her Prime Minister's Questions debut. As the two leaders clashed on workers' rights, Mrs May suggested Labour frontbenchers had to "double their workload" while Mr Corbyn "exploits the rules to further his own career". Mr Corbyn said Tories might find economic insecurity "funny" but millions of people did not. The Labour leader said the government's economic plan had "failed". "Is there another one?" he asked. Mr Corbyn said austerity meant people "being poorer" and "jobs being cut", prompting Mrs May to respond: "He calls it austerity. I call it living within our means." As is customary, Mrs May set out her meetings for the day, including talks with German Chancellor Angela Merkel. Her first ever PMQ came from Conservative MP John Glen about Monday night's Trident nuclear vote. Next up was the Labour leader, who welcomed her and said he hoped they could "debate seriously the future of our country and its place in the world". His early questions focused on housing, and the two leaders clashed on the lack of affordable homes. Once the niceties were out of the way, the new PM included a number of barbs at the Labour leader during her first PMQs session, saying the Opposition would spend the summer "tearing itself apart" with a leadership contest while the government would be "bringing this country back together". Mr Corbyn quizzed her on new Foreign Secretary Boris Johnson's previous comments about US President Barack Obama and his use in the past of the term "piccaninnies", a derogatory word for black children. And he questioned her pledge to stand up for people in insecure jobs, pointing to planned trade union curbs and the use of so-called zero-hours contracts. Mrs May said it was important to help those "struggling to make ends meet", going on to attack Labour's infighting. She said "I suspect there are many members on the Opposition benches who might be familiar with an unscrupulous boss; a boss who doesn't listen to his workers; a boss who requires some of his workers to double their workload; and maybe even a boss who exploits the rules to further his own career." Leaning forward and fixing Mr Corbyn with a direct stare, she added: "Remind him of anybody?" 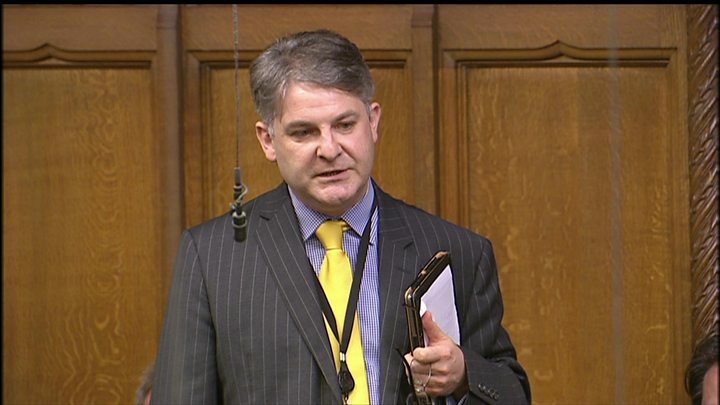 Media captionTheresa May and Philip Davies on cutting migration figures when the UK leaves the EU. Mrs May faced several questions about the UK's vote to leave the EU. Conservative MP Sir Edward Leigh asked her to be prepared to reject the EU single market when it comes to talks on the UK's exit - she declined to offer such a commitment. The PM also told Eurosceptic Philip Davies the Brexit vote "sent a very clear message about immigration" which was that people wanted control over EU free movement. She reaffirmed her commitment to hitting the government's target of bringing net migration down below 100,000, admitting it would "take some time to get there". SNP Westminster leader Angus Robertson adapted the PM's "Brexit means Brexit" assurance by insisting that "remain means remain" in Scotland. He asked how Scotland, which voted overall to stay in the EU, could do so if the rest of the UK leaves. Mrs May said the union was "very important" and promised to "engage fully" with the devolved administrations. 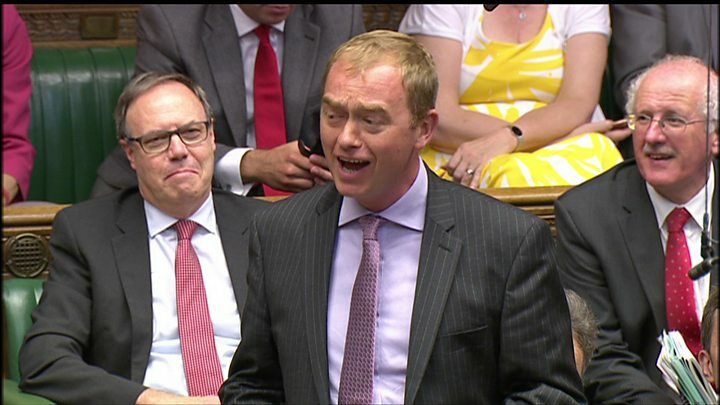 Media captionPMQs: Tim Farron and Theresa May on losing but going on to lead their parties. Liberal Democrat leader Tim Farron put the last question to Theresa May, reminding her of the time the two of them stood as candidates in North West Durham at the 1992 election. Mrs May replied that little did the voters there realise that two of the losing candidates would go on to be party leaders. She then ensured a light hearted end to the session as she added that "my party's a little bit bigger than his".